When a veritable parade of avionics manufacturers, including the biggest names in the business, all decide to create retrofit flat-panel avionics systems for one family of airplanes, you can guess that there’s some real opportunity there, and you’d be right. The airframe in question is the Beechcraft King Air and the companies looking to put their avionics in lots of them are Garmin International, Rockwell-Collins, BendixKing by Honeywell, and Sandel Avionics, all of whom have strong arguments why their panel is the best of the bunch. All of those flat-panel solutions, moreover, are quite different from each other, which is interesting in a number of ways, including the subject of how new technology can co-exist with old, and how much effort that marriage is worth. One of the most famous planes in aviation history, the Beechcraft King Air has been around for more than 50 years now, and in a surprisingly small number of iterations considering its success. Textron Aviation is still manufacturing the King Air in three different versions from the owner-flown C90 GTx up through the type-rating-required 350i. After all this time, it’s still one of the most successful models in the world. It’s not the fastest. It never has been. Models from Cessna (now a sister company under Textron) and Piper were faster and sexier. Rugged, roomy and capable, the King Air was still the king, though, and it easily outlasted the competition, outlasted it by decades, in fact. For many years it was the only GA turboprop twin being manufactured, and today its competition is tiny compared to the market share the King Air owns. If the key word in the preceding paragraph isn’t “capable,” it might just be “rugged.” King Airs even from the early days are still around. Later model-year examples, from the late ’70s and up, represent a great value on the used market. That’s so long as operators are willing to pay the way for two engines instead of one, an economic move that hundreds of owners of the Pilatus PC12, a single-engine large cabin turboprop, have opted to do. There are two major problems with the avionics systems in existing (doesn’t “existing” sound better than “used?”) King Airs. One is that they have autopilots, often really good autopilots, and retrofit autopilots are expensive to develop and won’t do much the original one couldn’t also do, which makes it hard to justify the expense, right? The second issue is that some of the avionics systems are just really good. 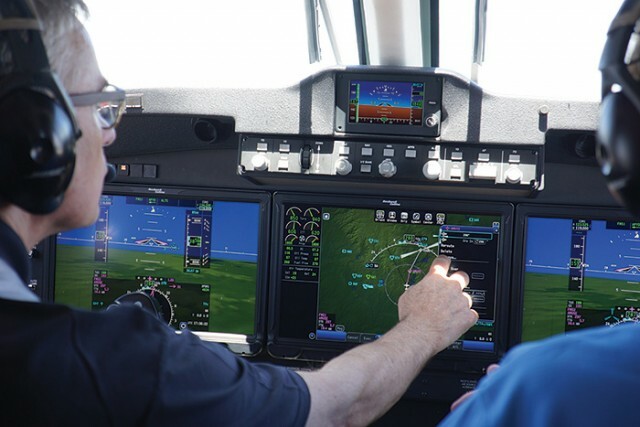 The Collins Pro Line 21 system, which had been standard for many years on King Airs before the introduction of Rockwell Collins’ new Pro Line Fusion by Textron, is a terrific system. It’s not modern by any stretch. If you were learning Pro Line 21 after getting handy with, say, Garmin G1000, it might feel as though you’d gone back to the days of DOS, with line entry and text menu systems required at just about every turn. It will be hard, though not impossible, for owners of Pro Line 21 airplanes to upgrade to any of the four flat-panel retrofit systems featured here. After all, it already is a flat-panel avionics system. Its displays are big and bright and plenty modern, just as modern as those fielded by a couple of the contenders here. Prior iterations of Pro Line, on the other hand, are begging for replacement, and with the airframes and engines being substantially similar between older models and ones built as recently as 10 years ago, there’s plenty of incentive for owners to do that. They’ll probably spend a few dollars on paint and interior while they’re at it. When contemplating a panel makeover or complete replacement, owners would be wise to work one new factor into the calculus: ADS-B. With a lot of legacy King Airs flying around still on vintage mechanical gauges, the clock is ticking loudly toward 2020, when every one of these airplanes will need to be ADS-B compliant. For many of them, that will be an expensive proposition. Remember that an integral part of ADS-B is the high-test version of GPS known as WAAS, so for King Airs with outdated navigation equipment, which is a lot of them, ADS-B compliance will require a really expensive upgrade to not only WAAS, but to high-flying ADS-B as well. How expensive can ADS-B be though? 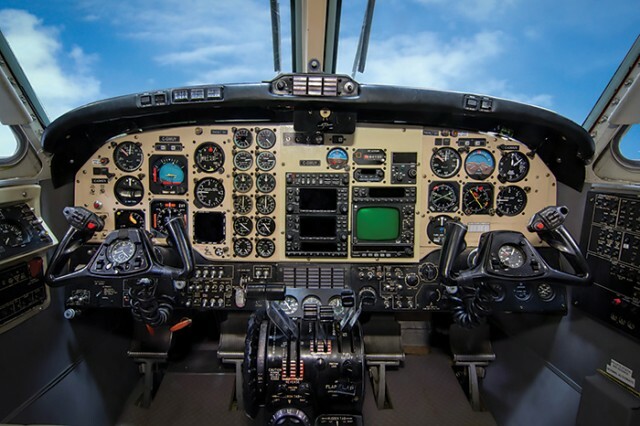 More than one avionics tech told us that on an airplane like a King Air, the cost of an ADS-B job could be a large percentage of a complete panel retrofit. In essence, for many older King Airs, and similarly complex and aging airplanes, by 2020 their ancient panels will be long past TBO. As with jets, the question is, since you’ll be spending the money one way or another, is it time for an overhaul or new, better performing and more efficient engines? In many cases, both with outdated engines and panels, the question answers itself. The other benefits of these panel overhauls are great for planes that lack certain of the latest safety utilities and for those that have legacy versions of them. Take radar, for example. On the Garmin G1000 panel retrofit program, owners get integrated radar control display capability, which is nice, but is it necessary? Probably not. That is until that legacy control/display unit fails and you’re looking at a very costly repair or replacement (if you can find the unit or the parts). These panel upgrades—and this is a critical part of the value proposition—are a hedge against future very expensive avionics maintenance events. Other typical advances in capability and safety that are available in some of these packages include datalink, the latest TCAS changes, LPV approaches, and RNP capability. 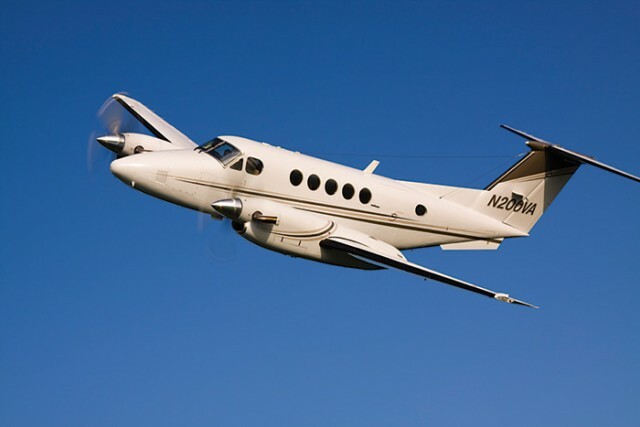 There’s so much added value, in fact, that the sum total of such additions to an existing King Air with legacy avionics would far surpass the seemingly hefty cost of these retrofit packages, which start at around $200,000 per plane and go up from there. Here’s an overview of the products offered by all four companies. Garmin has been in this market for the longest, with around 400 completed King Air G1000 retrofits completed, making it far and away the market leader in this segment, a state of affairs its competitors would like to change. That said, it will take some doing. Garmin’s position in the market is not only deep, but broad. It offers G1000 retrofits to virtually every King Air ever built. Another edge Garmin has is that G1000 has become ubiquitous in GA, with versions of it anchoring the cockpits of everything from new 172s to light jets. 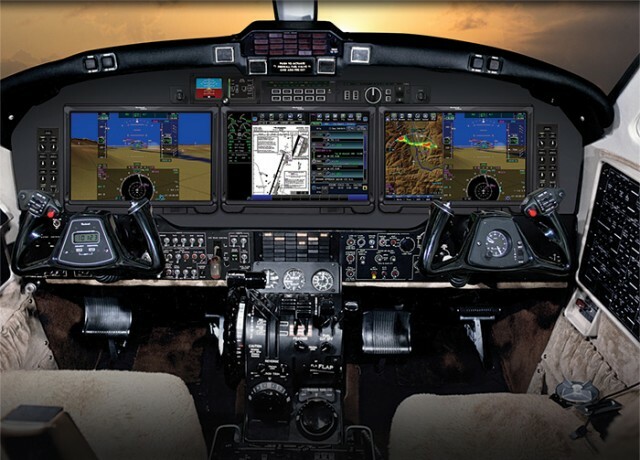 The cornerstone of G1000 is Garmin’s display technology. Two 10.4-inch LCDs serve as PFDs, one on either end, with a much larger multifunction display in the middle. Controls for the GFC700, a sophisticated and smooth flying autopilot, as most pilots know, are located up on the glareshield, the optimal place for the flight control interface. One option that many owners will select is Garmin’s attractive LED annunciator panel, which, again, is a great hedge against the obsolescence of the legacy annunciator panel but also against the inevitable loss of individual lights. Even better, G1000 can replace the rows of mechanical engine gauges with similarly configured but colorful LCDs, for greater ease of use and better monitoring of the gauges for exceedences. The G1000 retrofit solution for King Airs is a compromise in some ways compared to a factory installed G1000 package. With the retrofit, there are still a few legacy components to the system, including the cabin pressure controller, for instance, but even the hefty FMS controllers are banished from the center console, replaced by a single, elegant G1000 keyboard at a small fraction the size and weight. The Fusion retrofit package from Rockwell-Collins represents a bold future for existing King Airs. With the company the undisputed expert on King Air avionics, having been behind the production of the electronics in the airplane for the past several decades, the fit was perfect. 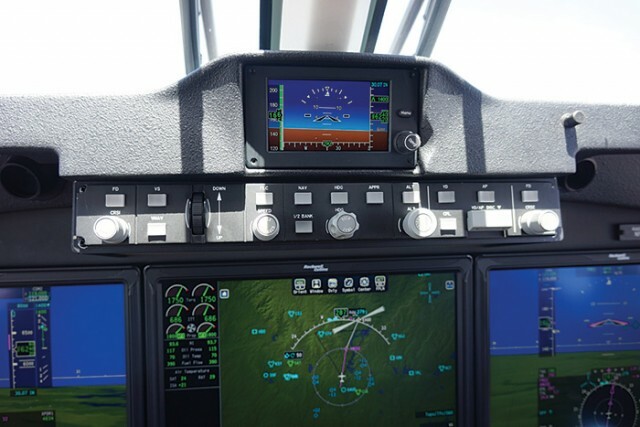 While Garmin’s G1000 and BendixKing’s AeroVue are modern flat-panel solutions, they do not represent the state-of-the art in the technology—Garmin’s G3000 touch controlled system and Honeywell’s Primus Epic successor, as seen on the Symmetry flight deck on the Gulfstream G500 and G600, are those cutting edge products. Fusion is, too. The system utilizes touch screens—reach up and use the displays. They’re set up to be easy to use in turbulence, well, as easy as conventional systems are, anyway. I’ve got a good deal of experience in Pro Line 21 King Airs (and Citations), and the difference between old and new is stark. The amount of heads-down time on Pro Line 21 is substantial, as pilots reach down to enter FMS data. 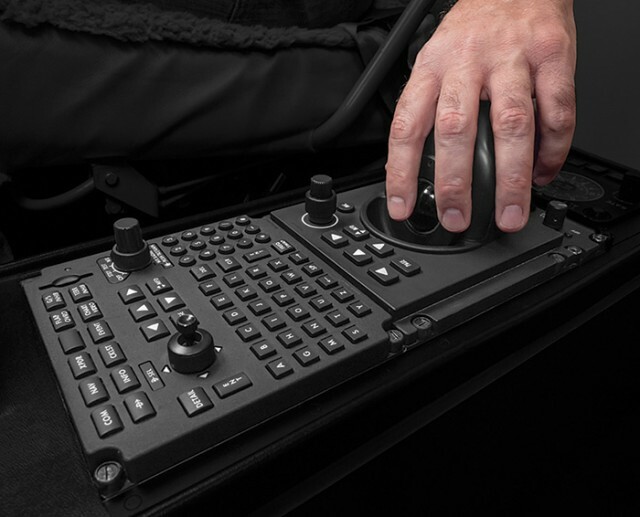 With Fusion, you reach up to the MFD and with your fingers drag and drop your waypoints. I flew a King Air 250 with the folks from Collins, and it was an eye-opener. On a short cross-country flight, we had a couple of changes in our flight plan….all I had to do was reach up to the MFD, drag the course line to a new waypoint, confirm it, and the system did the math. It’s brilliant. Fusion isn’t an all-up new integrated cockpit. Like G1000, it also incorporates a number of legacy components, including the autopilot, from the existing avionics installation. 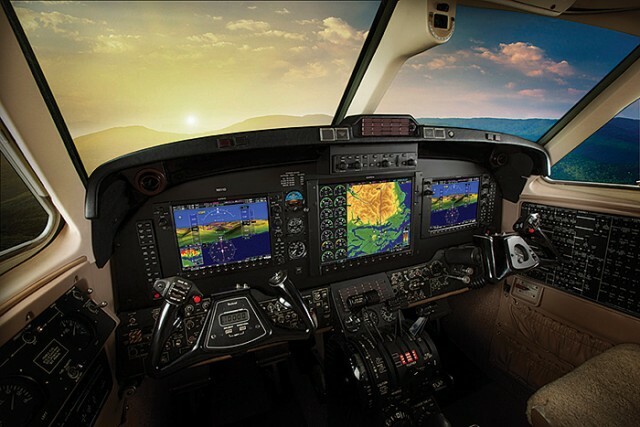 Like G1000, the end result is a greatly enhanced user-experience with a great many safety upgrades—I haven’t even mentioned digital charts and XM Sirius Weather yet—and future maintenance savings built in. • Candidate Models: All King Airs equipped with Pro Line 21 and King Air 350s with Pro Line II. • Typical Equipment Cost: For Pro Line 21-equipped King Air, contact Textron Aviation Services for pricing. For Pro Line II-equipped King Air 350s, contact authorized dealer. • Annunciator Panel: KA350 Pro Line II and Pro Line 21 to Fusion - you can remove the Annunciator panel and incorporate all the messages into an integrated CAS (Crew Alerting System) on the display. A brand that was the biggest in the business back when the King Air was born and that shares a part of its name, BendixKing is back and is leveraging the power of its parent company to bring the King Air a new flight deck option. The AeroVue integrated avionics package is very similar in form and function to the Apex glass cockpit in the Pilatus PC12 turboprop single. When I first flew an AeroVue PC12, it was deja vu, as the same look, logic and cursor-controlled menu system that I’d got a taste of on Falcon Jets and Gulfstreams was there in the PC12, a relationship I’m sure wasn’t lost on Pilatus. 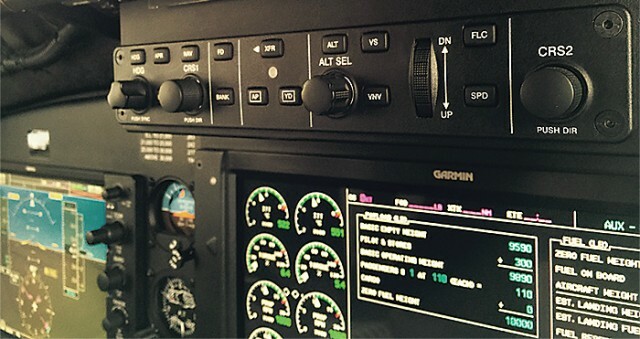 AeroVue includes all the goodies normally associated with flat-panel systems, including WAAS, dual attitude and heading sensors (ADAHRS), integrated nav/comms, checklists, XM Sirius Weather and digital charts. The system nicely integrates with legacy BendixKing and Honeywell TCAS and Enhanced Ground Proximity Warning Systems brand of terrain awareness hardware, which is common on existing King Airs. For pilots flying, it’s hard to beat the beauty of the Honeywell-developed primary flight display symbology, boasting synthetic vision with range rings (a feature King Air drivers will love as they make position reports inbound while VFR—one glance at the graphics and you’re ready to report). For pilots flying, it’s hard to beat the beauty of the Honeywell-developed primary flight display symbology, boasting synthetic vision with range rings (a feature King Air drivers will love as they make position reports inbound while VFR—one glance at the graphics and you’re ready to report). There’s also Honeywell’s excellent runway safety utilities built in to AeroVue, again a utility that seems custom made for the kinds of missions into numerous smaller and non-towered airports that many King Airs exist for. Candidate Models: Announced programs are for the Beechcraft King Air 200 / B200 / C90, and Cessna Citation V, Ultra, and Encore. • Typical Equipment Cost: Estimated fly-away price $295,000 - $425,000 for the King Air 200 / B200, based upon options selected and aircraft configuration. Pricing for the King Air C90 and Citation models has not yet been announced. 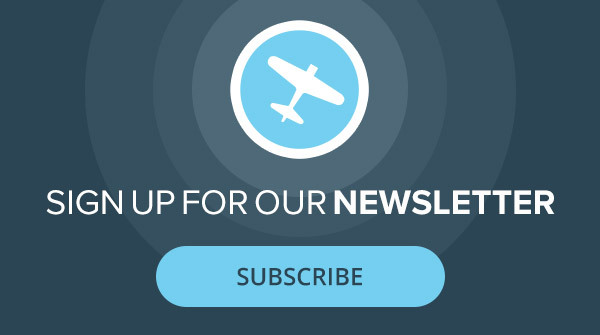 • New or existing autopilot? All-new, digital autopilot. • FMS and Data Input: CCD, FMS keypad, joystick, bezel buttons and knobs. • Radio Tuners (separate or integrated? ): Includes both: bezel knobs / numeric keypad, and integrated tuning. • Weather Radar Control/Display (integrated or standalone? ): Weather radar control and display is integrated within AeroVue. Perhaps the most intriguing—okay, simply the most intriguing—product here is also the only one from a company without experience in developing and delivering integrated flight decks. Sandel’s Avilon is groundbreaking in a number of ways. It comes fully preassembled—you pull out the old (the biggest part of the job, actually) and install the new completely modular panel, which is something that no avionics manufacturer has ever done. Perhaps even more shocking is the pricing: $175,000, installed. That isn’t the price for the installation but the price of the avionics package and the installation. A great cost and price certainty, along with the weight savings and capability upgrades that come part and parcel with flat-panel systems. Unlike its competitors, Avilon features four displays, two large primary flight displays on either pilot’s side and two portrait-format multifunction displays mounted in the center. Like several of the systems here, Avilon’s displays are highly user customizable, letting pilots segment the screens into multiple mini-displays. The weight savings from Sandel’s panel overhaul is huge, another great selling point for a compelling product. The legacy King Air panel with steam gauges is a thing of beauty but only in a steampunk way. One of Avilon’s most remarkable features, and one that every pilot will want, is a profile view of the course and flight path. It’s the kind of situation awareness that greatly cuts down on the risk of CFIT, a bigger risk in airplanes like the King Air that frequently fly into smaller airports, many of them with step-down approaches. Avilon is still going through the certification process, but Sandel already has a group of world-class dealer partners to jump on what is sure to be a spate of orders early from owners looking to make their vintage King Airs like new again, at least from the point of view of the people doing the flying. Paint, interior and engine upgrades will be extra. • Completed installations: On target for our first STC in a KA200 by mid-June 2016. It is a really interesting review. However, there is a misunderstanding when you state “Fusion isn’t an all-up new integrated cockpit. Like G1000, it also incorporates a number of legacy components, including the autopilot, from the existing avionics installation”. Garmin G1000 puts all new avionics components on the aircraft, including a complete new autopilot. You can use exisiting ADF receivers, if you want to, and some existing Com and Nav antennas, but that´s it. On the other side, Pro Line Fusion does use legacy existing components, instead.